Review: "Art Rock Circus: Heaven's Caf� Live" - Sea of Tranquility - The Web Destination for Progressive Music! Art Rock Circus is a performance rock band headed by guitarist John Miner. Some of you may know him as the other guest guitarist on K2's new CD Book of the Dead. Heaven's Caf� Live is a rock opera performed and captured during six weeks of shows in Los Angeles. The troup includes six singers, guitar (Miner), bass (Jon Cornell), drums (Jon Weisberg), and violin (Melanie Grimmett). There is no mistaking the "live" sound of this. At points it reminds me of a recorded high-school play with the interjection of the brief dialogue that introduces the song. And as sad as that is, what I most take away is the amateurish production of this release. Minor is a fabulous guitarist and the singing of Todd Ashmore and Miche' are excellent. But although this might make a good DVD, it is hard to get into this CD's show-tunes formula. It should be noted that originally the bass lines were played by Ken Jqaquess and Cornell does an excellent job of filling those really large shoes. 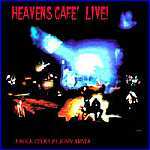 I have not heard the studio release of Heaven's Caf� but this CD peaked my interest enough to try and seek it out. I would recommend this to any fan that has seen the live performance and wants a really good memory captured on CD. Otherwise I think for most, Heaven's Caf� Live will not hold the attention enough to get many spins on the CD changer. The production just doesn't enhance the performances.